In this project Fortis leveled the bin structure and replaced the suspension cables that supported the bin. The new cables were equipped with load cells for uniform and controlled tensioning. The load cells will allow for close monitoring of the loading on the cables. Fortis built a cat walk to enable the maintenance personnel to check the cables and the load cells. The maintenance personnel can visually inspect each cable and load cell and make adjustments as required. 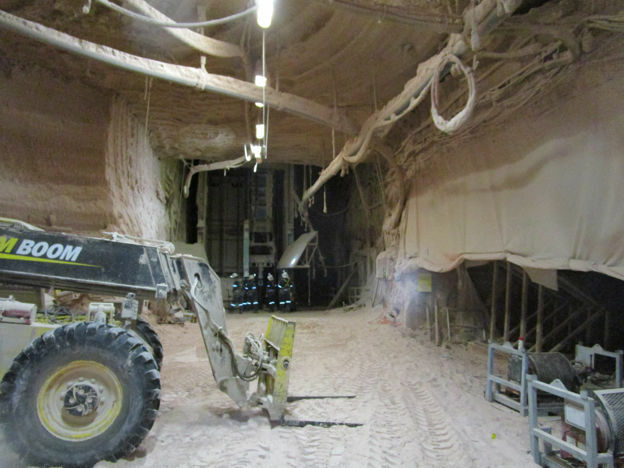 Fortis was contracted to complete repairs on one of the underground raw ore bins. 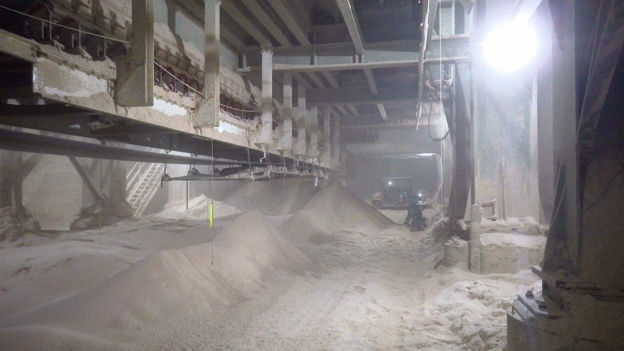 This 500 ton capacity bin needed to be leveled due to ground movement in the mine. 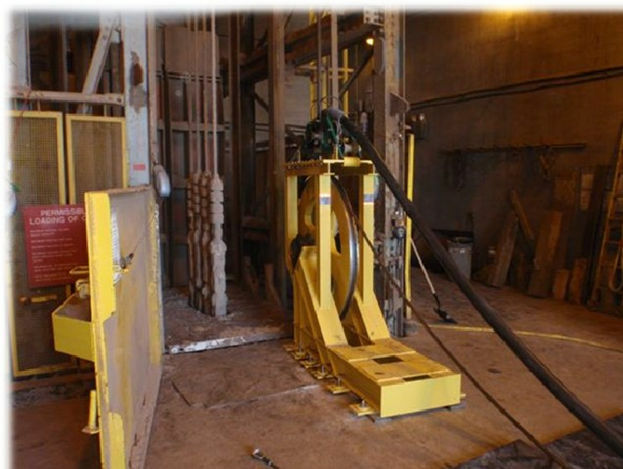 Fortis utilized hydraulic jacks to remove and replace shims as required to level the bin structure. Fortis completed the A-Frame Leg Bracing Project on the #2 headframe at PCS Allan. The scope of this project was to install four 75 foot long cylindrical braces on the existing A-frame legs. The use of two cranes and a man lift were utilized to safely complete these critical lifts. Working around weather delays, this project was successfully completed. Fortis successfully completed the loading pocket steel Installation. 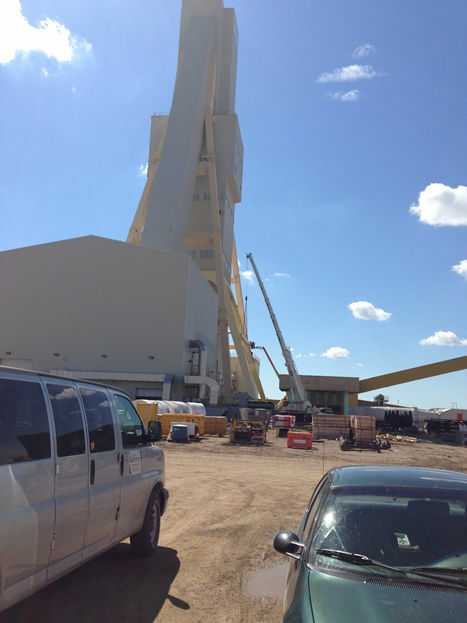 The scope of work included the supply and installation of tower steel from the loading pocket up to the potash level. Fortis was commissioned to remove and replace the structural tower steel. The project was time critical as this shaft is the service shaft which transports personnel and materials underground. Fortis successfully completed this project on time so Mosaic could return to their regularly scheduled cage times. This project consisted of a full removal, re-routing and re-installation of a new and larger conveyor system. 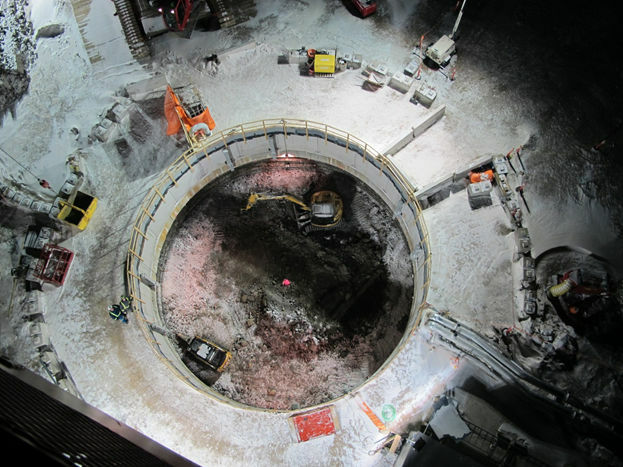 Fortis set a new record at the Mosaic site for installing two belt drive units in a twelve hour shift. Fortis is pleased to announce that the project was completed on-time, under-budget and with no lost time incidents. 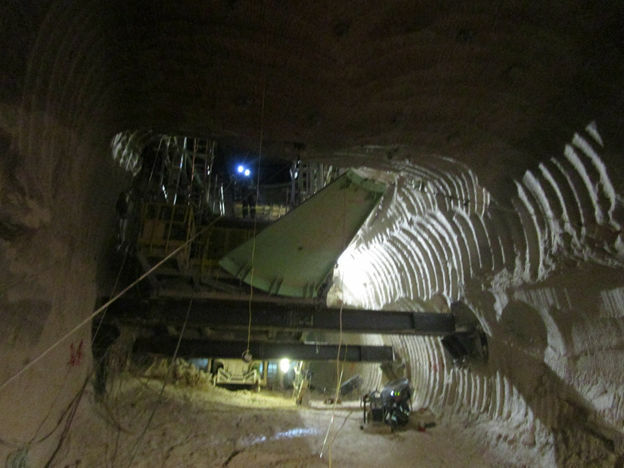 The project biggest challenge was the high traffic demands of the shaft to move Mosaic’s labour force in and out of the mine. Together with Mosaic, Fortis’ highly skilled personnel evaluated alternate methods to complete the scope of work in a safe and timely manner while allowing this movement to occur as to not disrupt production. Fortis compiled a methodology and timeline that met these demands and resulted in the project being completed according to schedule and incident free. The scope of work included the supply of the blocking brackets and removal and replacement of the shaft guides. This project was a three-phase project with SanGold. Phase 1 was completed by our manufacturing department where they fabricated all the blocking bracket and aluminum head cover. 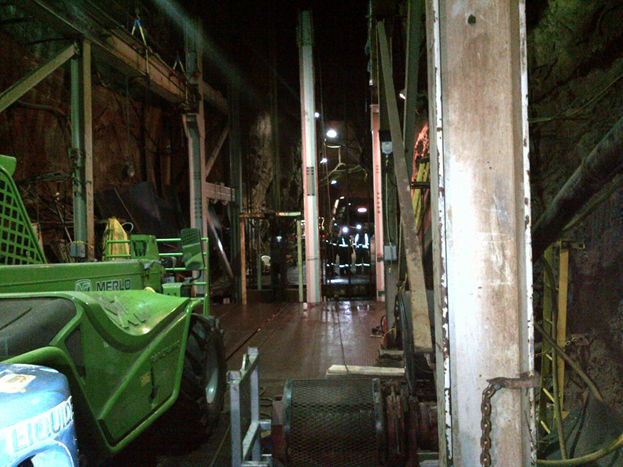 Phase 2 involved sending our mining work force to install the shaft blocking brackets. 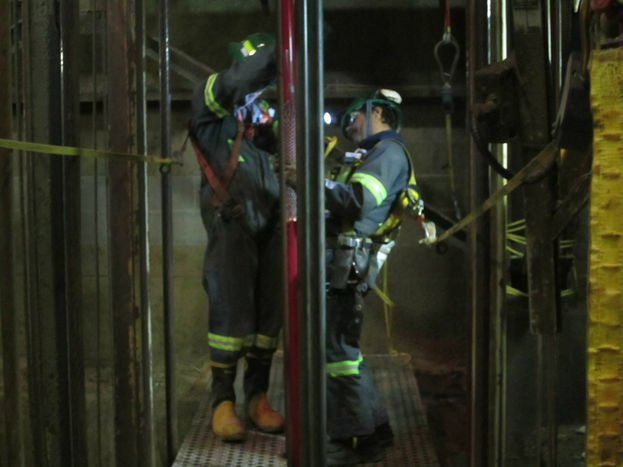 In October 2013, our crew returned to complete Phase 3 of the project: the installation of the shaft guides. Installation of these guides resulted in an increased skipping capacity. 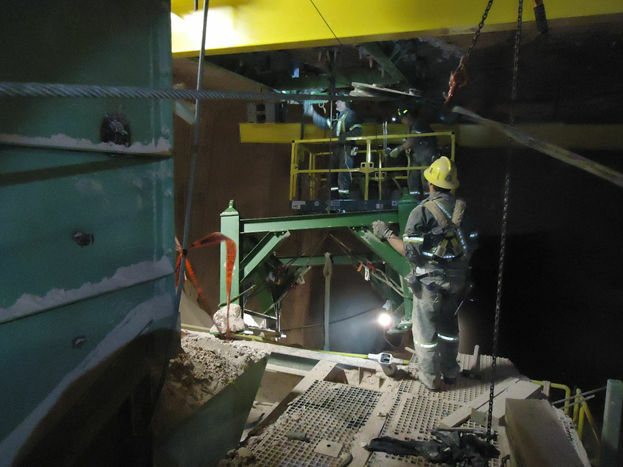 Fortis completed the installation of the partition wall, as well as furnish and commission the #2 Shaft at the Cigar Lake Mine located in Northern Saskatchewan as a subcontractor hired by DMC Mining Services. The scope of work included: demolition and removal of the existing conveyor; mucking, excavation, rehabilitation and rock bolting; installation of structural steel, mechanical equipment and all conveyor components. Fortis successfully completed the scope of work two days prior to its scheduled completion date with no safety incidents. Fortis is proud of the quality of work it provided and its timely completion. Fortis completed both shaft pre-sinks (production and service shaft) as well as completed the shaft liners from minus 50 to minus 7 as a subcontractor hired by DMC Mining Services. Fortis was also awarded the contract to install the dump and safety doors and all brattice in both head frames. Fortis was contracted to install six 25kV Feeder Cables in the Service Shaft. Fortis successfully completed the installation of three cables in 2011 and the remaining three in July 2012. Fortis utilizes a cross head with integrated camera to guide the cable down the shaft to the lower drift level at the bottom of the shaft. The cross head is assembled in the shaft on top of the skip or cage. Camera provides live video of the cable being lowered down the shaft. Fortis is using a load cell to monitor the weight at the sheave. Fortis completed shaft remediation on the concrete liner in #2 Shaft. Over time water began eroding the ground behind the concrete liner. This erosion then put pressure on the liner and began to push it out into the shaft. Fortis installed mine grid mesh and steel strapping to temporarily secure the liner until a long term plan is developed to repair the concrete liner.